The hotel is situated in a quiet and central position with views of the sea. The “Vittoria” hotel, a fine building in “Belle Epoque” style, set in the main square of the town, in front of the sea, has been fully modernized whilst retaining that air of grace and refined elegance which has long made it a fascinating element of Pesaro’s social and cultural life. The “Vittoria” Hotel, in fact, has for more than ninety years played host to the leading figures of the political, artistic, economic and aristocratic world, and has been the scene of countless important ceremonies, celebration and business. The hotel’s central position, peaceful surroundings, luxurious furnishings, with authentic period pieces, high level of modern comfort and services and wide range of leisure facilities all qualify the “Vittoria” as a truly first class establishment. Classic design unites with modern taste in all rooms, and the antique furnishings have been combined with up-to-date comodities such as soundproof rooms, colour television with satellite programs, wifi, internet point, radio, drink cooler, air conditioning, direct-dialling telephone both in the room and in the bathroom, safe, electric hair – dryer, bathroom scales and Jacuzzi hydro-massage. Many rooms are provided with balcony and overlook the sea. 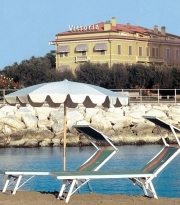 The “Vittoria” hotel also boasts a comfortable lounge with ancient fireplace, an inviting cocktail bar, an elegant tea-room, a quiet reading room and a spacious terrace overlooking the sea, where it is possible to have lunch during summer, the swimming pool. These spaces are richly decorated with antique stuccoes, columns and fittings… (in fact) the Hotel Vittoria is one of Italy’s “Hundred Historic Hotels”, the only one in the Marche region. Particular remarks have to be given to Restaurant Agorà, which has received many appreciations. Full board with “à la carte” menu and flexible meal times. Restaurant with first-class local and international specialities prepared with fresh, choice ingredients, many of which are produced locally. Fish specialities. Ample choice of top- quality guaranteed wines. Cocktail bar, terrace and veranda with music. Dining room for business lunches, dinners, banquets and special occasions, gala dinner. Reading and games rooms. Air conditioning, emergency safety lights throughout, wire radio. Automatic telephone exchange with direct-dialling from all rooms and internal call boxes. Garage, automatic lifts, safe telex, telefax. Hotel cycles and personal weighing machine. Sauna, mini-gymnasium and billiard room. Swimming pool, solarium, beach huts and facilities, sailing boat. Laundry, ironing and many other services. Translation, interpreter, secretarial, photocopy, telex and babysitting services, available on request. Sporting facilities, such as tennis courts, riding stables, swimming-school, windsurf, sailing, water skiing and conoeing are all available at a short distance from the hotel. The hotel is owned and managed by the Counts Marcucci Pinoli. Classic design unites with modern taste in all rooms, and the antique furnishings have been combined with up-to-date comodities such as soundproof rooms, colour television with satellite programs, wifi, internet point, radio, drink cooler, air conditioning, direct-dialling telephone both in the room and in the bathroom, safe, electric hair – dryer, bathroom scales and Jacuzzi hydro-massage. Go along motorway A14,choose the Pesaro exit and then turn right. At the second traffic – circle choose the direction to Rimini. At the next crossing-light turn right. This street is Viale della Repubblica and leads to the sea. At the end of the street you meet a sculpture (“The Big Spere”). Turn left and then turn right.